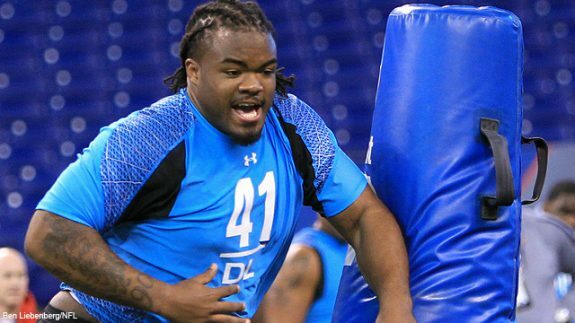 The Steelers are chatting with a couple prospects, as the big one in town is Memphis defensive tackle Dontari Poe, a guy that many think the Steelers will take with their first round pick. The Steelers are hosting five college prospects, including Memphis defensive tackle Dontari Poe, on the final day for pre-draft visits. The 6-4, 346-pound Poe is considered a surefire first-round pick, and he is of particular interest to the Steelers considering veteran nose tackle Casey Hampton is going into the final year of his contract. Poe sent his stock soaring at the NFL Scouting Combine in February, as he bench-pressed 225 pounds 44 times and ran a 4.98 in the 40-yard dash. He is one of the top defensive tackle prospects in the draft, and he may be gone before the Steelers’ first-round pick, No. 24 overall. The Steelers are also meeting with Cincinnati tight end Adrien Robinson, SMU guard Kelvin Beachum, Arkansas wide receiver Gregory Childs and Colorado wide receiver Toney Clemons at their South Side headquarters. Clemons is a local product, having starred at Valley High School in New Kensington. He started his college career at Michigan before transferring to Colorado.